What we have here at MotoeXotica Classic Cars is another potential advertising opportunity for the right entrepreneur who is seeking to inject some new life into their business with a rolling advertisement. We are pleased to offer this 1934 Ford Panel Truck. This is a perfect example of how dry goods and other items were delivered to homes and businesses prior to World War II. 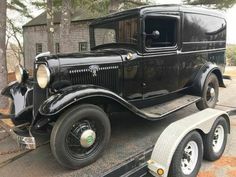 1934 is the pinnacle year for collectible Fords and this awesome utility vehicle will be one that most Ford collectors do not have. When\'s the last time yo saw A 34 Panel Truck? Finished in Butter Cream between Chocolate trim, roof and wings, the paint on this truck is in very over all good condition, having an older restoration that has some patina. The truck’s windows are clear and crack-free, while its lights, including the fog lights, are also clear and intact. The running board step plates and chrome mirrors also look good. The truck’s bodywork is straight and solid, its chrome bumpers fit tightly to the body, the engine bay is very tidy, it rolls on Denman tires, size 5.25-5.50-17, and each one is wrapped around a Ford factory wire wheel, painted red. Note : The folding hood hood does have some cracking in the paint and A section on the nose that has a large chip. There’s also a passenger side-mounted spare tire and wheel that matches the others and is protected with a tan Ford cover. Note that there is only a windshield wiper on the driver’s side, as was common practice in that era. Underneath the vee’d hood is a 221 CID, 21-stud Ford Flathead V-8 engine with a Stromberg downdraft carburetor. Backing up that engine is a three-speed sliding gear manual transmission. Inside, the front seats are upholstered in caramel, are in great condition and stand out from the rest of the black interior. The rear cargo floor is wood and the vinyl sidewalls are in extremely clean condition and the speedometer and odometer is inoperable . The headliner and three-spoke steering wheel are in satisfactory order while the metal instrument panel, with its Stewart Warner gauges, is in excellent shape and the inner door liners look very good. Competition to this Ford in 1934 included Chevrolet’s Master series Panel Truck and Dodge’s Humpback Panel Truck. This Great Depression-era survivor would make an ideal way to deliver anything over around town, from dry goods to clothes, public relations collateral for a start-up or small business to beverage cases or other items. Drop by MotoeXotica Classic Cars and check into the possibilities of putting your company’s signage on this truck and driving it to work or making it your rolling office. This truck is currently located at our facility in St. Louis, Missouri. Current mileage on the odometer shows 30,000 miles. It is sold as is, where is, on a clean and clear, mileage exempt title. GET OUT AND DRIVE!! !